With a fast-growing economy that hosts the world’s top tech talent and a support system that accelerates the best homegrown ideas, the future looks bright for solutions launching from this innovation hub. There is not much talk of ‘saints and scholars’ on the streets of Dublin today. In the city’s gleaming tech quarter, known locally as Silicon Docks, its multilingual, youthful chat focuses on plans, start-ups, meeting places, who’s going where after work and who’s got the latest big idea. There’s a sense of urgent purpose in the air. Things are happening. As greatly changed as Ireland is today, it is worth contemplating the origins of that phrase ‘the land of saints and scholars’. The country has a centuries-old, globally-respected tradition for academic excellence and high standards of education. That much hasn’t changed. Today, not only has Ireland the youngest population in the whole of Europe, it also has one of the most highly educated. Ranked 1st in knowledge diffusion, 2nd in knowledge impact (Global Innovation Index). The ready availability of talented, adaptable, well-educated young people is one reason that Ireland is now home to Facebook, Google, Twitter et al. An emphasis on flexibility and skills development has also created a highly desirable culture of innovation and invention. But neither is this new. For a small country, it is staggering how many important inventions can be traced back to Ireland. The submarine, for example, was invented by Irish engineer John Philip Holland, a contemporary (and acquaintance) of Thomas Edison. Holland’s submarine was the first to be formally commissioned by the US Navy; he also developed the first British Royal Navy submarine, the Holland 1. Then there’s colour photography, invented by Irish geologist and Trinity College Dublin graduate John Joly. The syringe, or hypodermic needle, invented by Dublin doctor Francis Rynd. The guided torpedo, invented by Mayo man Louis Brennan (who also helped develop the helicopter). Seismology – not only the modern science but the actual word – invented by Irish geophysicist Robert Mallet. One more? Well, if you are one of the 20% of adults in the world who has a tattoo (in the US alone, it’s estimated that around 45 million people now have one) then you most likely got inked with an electric tattoo machine, which was invented by Samuel O’Reilly. As the name rather suggests, O’Reilly was the son of Irish immigrants. These historical examples show that the Irish culture of innovation is not a new phenomenon. The past has paved the way for the present, with Ireland now regarded as a hotbed of entrepreneurship benefiting from both a resurgent economy – the EU’s fastest-growing economy for the past four consecutive years – and a young, highly-employable population. These elements, in turn, have attracted the presence of all of the global big-hitters from the world of technology: Google, Amazon, IBM, LinkedIn, PayPal, Twitter, Dropbox, Etsy, Groupon, Airbnb, Uber, Siemens, HP, Dell, Microsoft, Intel, Symantec, the list goes on and on; a who’s-who of the world’s most desirable brands. While the tech sector grabs most of the headlines, Ireland’s pharmaceutical and medtech industry has also quietly moved into overdrive. 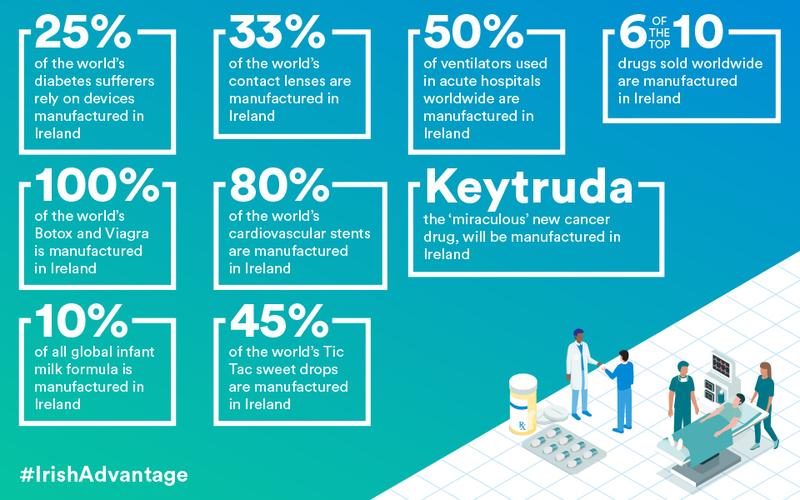 Ireland is now the location of choice for global drug manufacturers, with seven of the world’s top 10 biopharmaceutical companies – including Boston Scientific, Pfizer and Johnson & Johnson – all based here. The presence of multinationals has energised the local scene, with local businesses increasingly working as co-developers with (and sub-suppliers to) the world’s biggest medtech companies. This in turn has boosted local expertise and made Irish technology even more attractive to overseas partners. Multinationals will always be attracted by a young, highly-skilled population and a business-friendly environment. Their presence then provides resources and opportunities for indigenous ideas, entrepreneurs and start-ups, while a growing range of partnerships between business and educational bodies fuels the conveyor belt of talent. Ireland’s innovation ecosystem is further strengthened by the role of Enterprise Ireland – the national trade agency – which helps to develop indigenous businesses including start-ups. Now one of the most prolific seed investors in the world, Enterprise Ireland makes equity investments in around 200 early-stage companies each year. If the past was merely promising, the present is a spectacular affirmation of Ireland’s growing, global status as a place of innovation. With a fast-growing economy, a young, highly-educated workforce, and a support system designed to support the best of talent and imagination, the future looks bright indeed. Multihog, the tractor manufacturer supported by Enterprise Ireland, the government organization responsible for the development and growth of Irish enterprises, today announced $1.7 million in new business with North American machinery companies. The new business includes initial orders for Multihog machines to three new North American dealers, two in the US Midwest and one in Canada. The dealers include Bonnell Equipment, a leading truck equipment distributors in Northern Illinois and a major supplier of snowploughs and spreaders for municipalities; Brown Equipment Co., Inc, which services customers in both the government and private sectors in Indiana and Kentucky, and Les Machineries St-Jovite leaders in the field of snow removal equipment and dump trucks in Quebec and Alpine Smith Inc. who ordered five new machines. Based in Dundalk, Co. Louth, Multihog has a new 89,000 sq. ft. 6-acre facility. The location manufactures a range of tractors that allow for easy add and removal of attachments to perform various maintenance functions all year round. It sells its product through a global network of 55 dealers who serve municipalities, airports, and facilities management companies. Enterprise Ireland recently hosted a partnership visit which brought together eighteen North American companies to visit the new Multihog facility in Dundalk and to meet with other Enterprise Ireland clients such as, Combilift, Archway Products, MDS International, Oriel Flues, Oxymem, Major Equipment, Skip-Tracks and Multi-Sweep (Rota Contracts). The visit aims to promote the strength and growing capability of Ireland’s machinery manufacturing offering. “The opportunity to highlight many facilities in the area provides a key opportunity to showcase Ireland’s capability in the municipal equipment space to leading dealers across North America,” said Ryan Shaughnessy, Senior Vice President, Industrial Technology at Enterprise Ireland Chicago. “We are proud of Multihog and this success and look forward to further partnership between Enterprise Ireland clients and North American dealers in this unique market”. Irish suppliers have much to offer customers in Singapore and the ASEAN region, according to Smruti Inamdar, Director ASEAN at Enterprise Ireland Singapore. Affinities shared by Singapore and Ireland are making Irish companies increasingly attractive to ASEAN partners and customers. Coming from a small open economy, Irish companies inherently understand that the region cannot be treated as a cohesive or homogeneous bloc and that each individual market is unique. Irish companies also appreciate the need to spend time building relationships with local customers and partners. When delivering long-term projects, Irish companies are known for adopting a flexible approach, working in partnership with customers to deliver the best solution, even when unexpected challenges or changes arise. The appeal of this approach is evident in the growth of Irish exports to, and presences in, Singapore and ASEAN. There are now approximately 300 Irish companies exporting to the region, with 130 companies having at least one presence on the ground. That number continues to grow. Exports from Ireland to the region reached €320 million last year, following five consecutive years of double-digit growth. Enterprise Ireland, the national export agency, has demonstrated its confidence in the development of the relationship, aiming to increase total exports to €500 million by 2020. If you are interested in discussing the advantages of sourcing an Irish partner, Enterprise Ireland can help you to assess which innovative products, services, and solutions may be best suited to your requirements. Let’s take a close look at key sectors in which Irish companies offer a particularly strong advantage to partners in Singapore and ASEAN. With investment in aerospace and aviation continuing to grow, Ireland is emerging as a global hub servicing the needs of rapidly developing industries. Over 250 Irish companies are actively engaged in aerospace and aviation and over 40% of the world’s fleet of leased aircraft are owned and managed from Ireland. That performance has helped Ireland to become widely regarded as a global centre of excellence for aviation, with its proud history of pioneering developments and dynamic innovation. As the world’s fastest-growing air hub, Singapore must expand its infrastructure to meet growing demand. In July 2017, Singapore to Jakarta and Singapore to Kuala Lumpur were included in the top five of the world’s busiest international air routes. The development of a T5 mega passenger terminal remains on the drawing board, which, when completed, would have the capacity to handle 132 million passengers a year, a huge jump from the 82 million passengers currently served. In contributing to the region, Irish companies including CAE, Eirtech Aviation and Aero Inspection lead the way, securing aviation opportunities in the wider region from bases in Singapore. To demonstrate Irish capability in the sector, Enterprise Ireland participated alongside nine client companies in the Aviation Festival Asia in Singapore in February 2018. As one of the most dense and vibrant urban areas in the world, Singapore is very much leading the way internationally in creating a sustainable building environment. There is much potential for Irish companies to help deliver the government’s ambitious agenda in this area. Singapore is striving towards a target of ‘greening’ 80% of new and existing buildings by 2030 (currently at approximately 30%). The power consumption of Tanjong Pagar Centre, Singapore’s tallest building, is managed by Dublin-headquartered Cylon Controls. Dortek hygienic doors have been used in an inflight catering kitchen facility in Singapore’s Changi Airport, providing hygienic and low temperature sealing solutions to the facility. Enterprise Ireland is also actively working with the Singapore Green Building Council to build awareness of Irish technologies in the area. The growing Irish green-build cluster includes firms such as Kingspan Insulated Panels and LED Group ROBUS. Irish companies in the high-end construction sector are well positioned to support Singapore’s transformation as a data centre hub for the Asia Pacific region, with the country’s colocation data centre market expected to grow at 13% year-on-year 2017 – 2018 (Source: Structure Research, 2017). Global and regional data centre providers such as Global Switch, Digital Realty, Equinix, Microsoft and Amazon are all operating in Singapore as well as Irish companies active in data centre development, including Linesight, PM Group, and E+I Engineering. Ireland and Singapore are relatively similar, with both having a small number of local banks and several hundred international financial institutions also located in the market. That shared ecosystem makes for a highly competitive arena in which innovation is a crucial driver. Ireland is home to one of the most important financial services centres in the EU and one of the world’s largest concentrations of technology companies. As the main financial services hub in the ASEAN region, a strong cohort of Irish companies are active in Singapore having secured significant wins with SGX (Singapore Exchange), United Overseas Bank (UOB), and Standard Chartered Bank. Ireland’s global leadership in the fintech, regtech and insurtech spaces is also making an impact in other financial hubs in the broader region. With over 40% of global hedge fund assets serviced in Ireland, its resulting regulatory expertise is leveraged by Irish fintech companies to help funds, banks and insurance companies deal efficiently with compliance, and make better, data-driven management decisions. An established sector of payments technology companies has a strong track record of helping major banks and marketplaces to respond to rapid digitisation and changing consumer demand. Another key offering from Ireland is in telecommunications and Internet of Things (IoT), with Irish technology companies delivering high-end solutions to mobile network operators (MNOs) across the ASEAN region. Irish technology providers have progressed from the provision of SMS technologies and services to more sophisticated data analytics, IoT solutions and technologies used to enhance customer experience. Irish companies in the sector have been active in the ASEAN region for many years, developing leading solutions to meet the evolving needs of local operators. The Irish telco cluster in ASEAN includes Accuris Networks, Anam, Asavie, Nasctech, Openmind, Tango, and Openet, which has more than 250 staff based in their regional HQ in Kuala Lumpur, Malaysia. Many are now doing business with major operators such as Axiata Group , Globe Telecom in the Philippines, Singtel in Singapore, and Vietnamobile in Vietnam. Bartosz Siepracki of Enterprise Ireland’s Warsaw office describes why Polish and Irish companies make great partners. With more than 122,000 Polish people living in the Republic of Ireland, the largest group of non-nationals resident in the country is no longer the British but the Poles. Although Ireland has two official languages, English and Irish or ‘Gaeilge’, more of the country’s population now speak Polszczyzna than speak Irish. Commercially, the value of trade between the two countries is more than €3.4bln. Poland is Ireland’s 15th largest overseas market, accounting for more than €2bln in exports. The value of this trade continues to grow rapidly because there are many good reasons for the two countries to do business together. Polish businesses will be assured of Ireland’s success in international benchmarks, with Irish SMEs ranked first for innovation, first for flexibility and third for supply chain resilience in the EU. While Ireland remains very committed to the European Union, its economy is more open than some European neighbours. For decades, the world’s largest IT and pharmaceutical companies have located significant facilities in the country. The presence of these companies in the ecosystem enabled Irish suppliers of products and services to gain significant experience in providing world-class levels of quality assurance. Ireland has also proven very successful in forging collaborative links between business and third-level institutions, rating in the top ten for scientific research. The areas in which it has performed particularly well for R&D are: #1 Nanotechnology, #2 Animal and Dairy, #3 Chemistry, #3 Immunology, #3 Materials Sciences, #3 Agricultural Sciences and #4 Mathematics. The areas of innovation in which Irish companies are succeeding in are well suited to Polish interests, particularly in developing sectors such as business process outsourcing (BPO). Both Dublin and Krakow are recognised as BPO hubs, with Krakow ranked eighth in the world and Dublin ranked seventh. In Poland, the number of people employed in the sector is at 240,000, in Ireland it is about 10,000. While Poland has scale, the sector in Ireland is more advanced in terms of technology and expertise, creating good opportunities for synergy. With Ireland listed in the top ten ‘most reputable’ countries to do business, business ethics and transparency are valued and contracts are straightforward. That said, Irish business culture is not legalistic, and its people are known for their flexibility. While companies in some countries might insist on sticking to a standard contract for example, those from Ireland are usually prepared to compromise and negotiate, always looking for a win-win situation. While Irish companies generally don’t do a hard sell, they excel at creating and developing long-term relationships that are built on trust. Irish companies want you to enjoy doing business with them. When Poland joined the EU in 2004, Ireland was one of the first countries to allow Polish immigration. As a result, you will find Polish people working in all kinds of Irish companies in all kinds of roles, marketing, accounts and production. As a result, any communication issues between Polish and Irish partners are easily overcome. To source a partner that will deliver on their promise and that you will enjoy doing business with, choose an Irish company to assist your operations in Poland. To learn more about how about Irish firms can help your business, contact Bartosz Siepracki at Enterprise Ireland’s Warsaw Office on + 22-583-1201. The latest findings from the State of European Tech 2017 report show that Ireland’s tech ecosystem continues to expand. Ireland’s rankings in the annual report point to the strength of the country’s resident tech workforce. Ireland has the fastest-growing tech worker population in Europe for 2017, with the expectation that impacts of the Brexit vote will see that figure grow further. The ranking is significant as access to talent is cited as “by far the most important factor” influencing founder location decisions in Europe. The UK and Ireland attract the highest share of talent from across Europe, with inbound talent arriving mainly from Southern Europe, Central and Eastern Europe, and the Baltics. 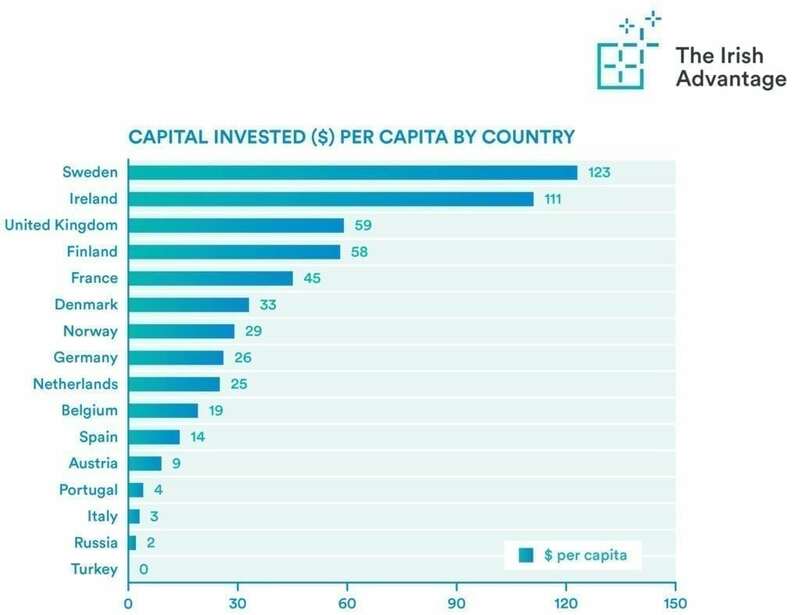 The report also found that Ireland is one of the top ten destinations for capital invested in Europe and has raised more than $1 billion since 2012. Ireland ranks in the top ten European countries for DeepTech investment, covering technologies like Artificial Intelligence and Machine Learning, Augmented and Virtual Reality, and Blockchain, a sector that is expected to continue to attract large amounts of venture capital funding in the medium term. 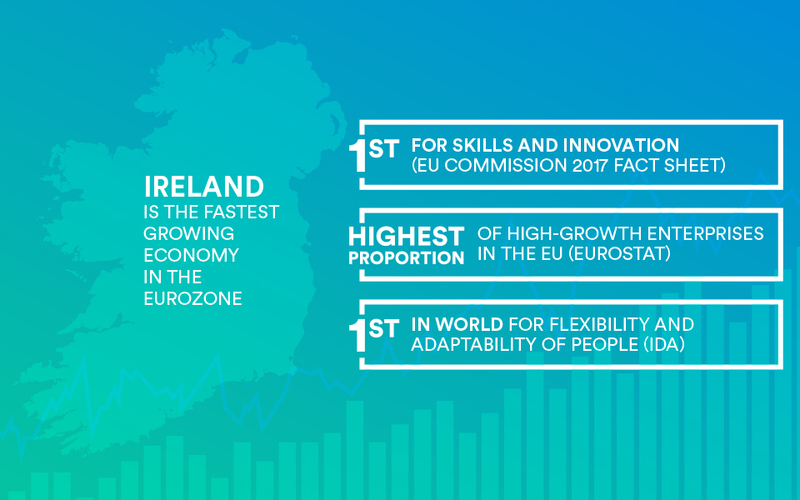 Earlier this month, Ireland was named first for skills and innovation in the EU Commission’s 2017 Fact Sheet. In October, Eurostat research found that Ireland has the highest proportion of high-growth enterprises in the EU, ahead of the UK, Portugal, Hungary and Bulgaria. The recent rankings reflect Ireland’s growing reputation for innovation, a key source of competitive advantage. Ireland’s workforce was named first for flexibility and adaptability in IMD’s 2017 Global Competitiveness Yearbook. The report brings positive news for the sector more broadly, with this year’s findings showing that the state of European tech in 2017 is the strongest it has ever been. Europe’s tech industry is creating jobs faster than the rest of the European economy, with the tech workforce growing significantly faster than overall EU employment. Europe saw 3 x year-on-year growth in the tech worker population, compared to just 0.8% growth in overall EU employment, according to the European Commission’s latest economic forecast for Winter 2017. The State of European Tech 2017 report is the most comprehensive and data-driven portrait of Europe’s technology ecosystem to date and illustrates the world-class innovation the tech sector is producing in Europe. The report was produced by Atomico in partnership with tech and business leaders including LinkedIn, Stack Overflow, Meetup, the London Stock Exchange, European Startup Initiative, and the European Investment Fund. Read the full State of European Tech 2017 report here. Ireland was named first for skills and innovation in the European Commission’s 2017 Small Business Act Fact Sheet. The latest ranking builds on Ireland’s international reputation for innovation. The European Commission’s Innovation Scorecard 2017 also ranked Irish small and medium sized enterprises (SMEs) top for innovation. The European Commission publishes Small Business Act (SBA) Fact Sheets annually, with the objective of improving understanding of trends and policies affecting SMEs across the European Union. The SBA focuses on key performance indicators and policy measures organised around 10 principles, including entrepreneurship, internationalisation, state aid and public procurement. Ireland’s SBA profile remains highly competitive, with the European Commission’s Fact Sheet 2017 presenting a number of improvements on last year’s performance. In eight of the SBA areas — entrepreneurship, ‘second chance’, ‘responsive administration’, state aid and public procurement, access to finance, single market, skills and innovation and internationalisation — Ireland performs above or well above the European average. Earlier this year, Eurostat research found that Ireland has the highest proportion of high-growth enterprises in the EU, ahead of the UK, Portugal, Hungary and Bulgaria. Customers and partners of Irish companies worldwide leverage this innovation to increase efficiency and productivity in ways that enhance their product portfolios. The Irish government continues to put innovation at the top of its agenda with the implementation of its Innovation 2020 strategy. Subscribe to the newsletter to stay up-to-date with the latest innovations from Ireland. New Eurostat research has found that Ireland has the highest proportion of high-growth enterprises in the EU, ahead of the UK, Portugal, Hungary and Bulgaria. The latest research published by the official statistics unit of the EU also found that high-growth enterprises have a significant impact on employment. 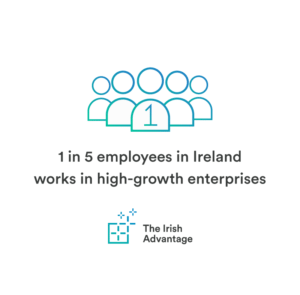 In 2015, 1 in 5 employees in Ireland worked in high-growth enterprises. Eurostat defines a high-growth enterprise as a company with average annualised growth in number of employees greater than 10 per cent a year over a three-year period. Ireland is now the first for high-growth enterprises in Europe, having moved up three places in the rankings from the previous report. OECD research has previously pointed to innovation as a key factor in the high growth of firms. The OECD further found that high-growth enterprises in turn drive job creation and innovation. Ireland’s position as first for high-growth enterprises in Europe is an indicator of the culture of innovation that continues to deliver competitive advantage for partners in all sectors worldwide. In 2017, the European Commission’s Innovation Scorecard also ranked Irish SMEs number one for innovation. Ireland’s open and fast-moving economy has fostered business people and high-growth companies with an unequalled track record of using innovation to meet the needs of global market leaders. Customers of Irish companies around the world leverage this innovation to improve operational efficiency and productivity and enhance their own product portfolios. The latest Eurostat findings can be seen as an outcome of two decades of investment in science and technology. The Irish Government continues to prioritise innovation first as it implements its Innovation 2020 strategy. A main aim of the strategy is to ensure that companies based in Ireland outperform their competitors in international markets, as they do in the latest Eurostat results.